Please say it ain’t so. Taylor Momsen? X Factor? No way. I have loads of respect for Simon Cowell. 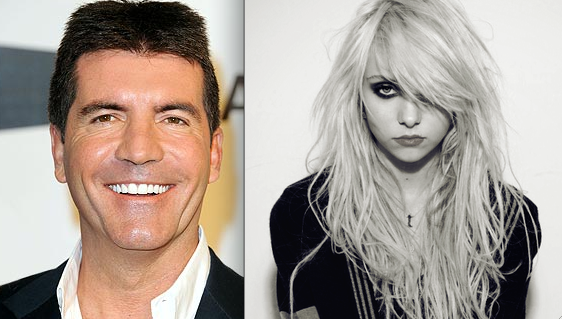 BUT, choosing Taylor Momsen to be a judge on X Factor sounds like one of the worst ideas I’ve ever heard of. Do you want to offend the majority of your viewers from the get-go? Jessica Simpson was supposedly in the running. I haven’t heard anything on her lately. L.A. Reid has been confirmed as a judge. Enrique Iglesias is supposed to be the host. Then Nicki Minaj’s name came up for a judge’s spot. Now we’ve got Taylor Momsen ready to sign?! She nasty. What is Simon thinking?! Sources are saying that he’s thinking she’s ‘young, hip, and edgy.’ Sure if that’s what you want to call behaving like a total skank at a VERY young age. I really hope this doesn’t pan out. I want to ENJOY this debut season of X Factor, not be tormented my Taylor Momsen, her nasty attire and her horrible attitude.